This unique gun can fire baby cephalopods, or help one aim and fire a squirt of blinding ink! **Click to switch the Cephalauncher to blind mode! **Click to switch the Cephalauncher to damage mode! *†You switch the Cephalauncher to blind mode! ††You switch the Cephalauncher to damage mode! This staff holds within it the power of a raging ocean. It can sometimes unleash a powerful tidal wave that strikes with incredible force! This small cutlass is wielded by more magically adept pirates and shines with light. It deals less damage than other magical weapons, but holding it amplifies the power of your Light spells! This small cutlass is wielded by more magically adept pirates and radiates heat. It deals less damage than other magical weapons, but holding it amplifies the power of your Fire spells! This cutlass lets you reap some of the damage you sow, healing your SP based on the damage you deal! 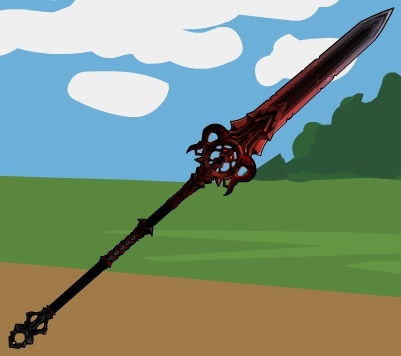 Works similarly to the Pumpkin Fang, Magic Light/Fire (respectively) Dagger/Athame, no special, has a 1/3 base lean and a +3 BtH lean. MC Effect: Deals -10% damage with weapon attacks. Spells of the weapon's element deal +28.125% damage in exchange. No Special, so +9% damage. MC: Heal SP equal to 5.625% of the damage dealt with the weapon. Magic Water Staff, neutral damage/BtH lean. MC effect is the special does +1/6 damage. We still don't have infosubs for updated Number 9 and 6-Ton Gun from Hollow's Garage. Temp Ranged Fire gun. 100% proc. Weapon scales to (Your Level) for Adventurers, or (Your Guardian Level) for Guardians. No "special" special, so +2% damage. Attack is at -10 BTH lean. Triggers on Devourer minions - eleSeeks and does +10% damage. It scales, so below are example values. Ice Melee "club". -5 BTH lean. Made from Grakma horn, this weapon draws on the powers gathered by ages-old Grakma. They don't get to be that old and powerful by giving up - and this «blade/spear/blade» doesn't give up either! Your weapon refuses to have its attacks miss, and lashes out! There is no red glow on the weapons, like in the preview news letter. 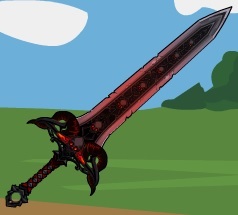 MC Fire Melee sword/Ranged spear/Magic sword. +3 BTH lean on the spear, and +0 BTH lean on the swords. I know the Info Subs for the Blood Ruby Rod is not out yet, but the lv150 version displays as 14-34 Melee Damage, I believe that is actually the Magic Damage, 14-34 is too low for Melee. Energy sword. Click to swap Melee/Magic. +3 BTH lean on normal player attacks. Special is three Magic hits, +5 BTH lean. The special takes -49.95% damage (Melee) or -69.49% damage (Magic). There's a [hits connected]/3 chance of turning the monster into ruby (a re-named, re-coloured Hypersalinate) for 1 round. The monster can resist with a save at a +0 bonus (inflict with VStat/LUK, resist with END/LUK). The shop still shows the bugged BRs even after I cleared my cache. Toggle description is also misleading, saying to click for physical when it's already in Melee mode. Sidbits! Tasty donut holes from a coffee shop named after a hockey player - the perfect snack for Canadian Thanksgiving! This slingshot lets you fire off dark chocolate or shockingly sweet blue raspberry ones! 100-proc ranged slingshot. All tiers cost Gold. Since it has a true special, the non-special hits have bow stats (with appropriate stat bonuses) and take -10% damage. HOWEVER, it's currently bugged, so the first time you log in, until you switch the element for the first time, it does not do energy damage, but Death/Snuggles damage. When you switch the element the bug is remedied until your next login. I already said it could switch between Darkness and Energy by clicking the orb. Energy/Darkness Ranged Bow (Slingshots are kind of a bow, right? ), MC is ele compression. Has a normal bow special and a 20% proc normal special. 1/3 base lean, no BtH lean. 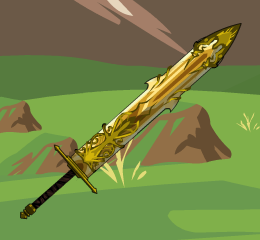 This will be moved to the Guardian Account shop in ~1 month, so Adventurers only have it for a limited time. 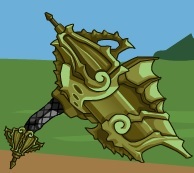 We updated the Dragon Buster series of items. Minor tweaks were making them MC (which removed the downtrigger) as well as making the +5%/+10% damage bonus additive instead of a multiplier. 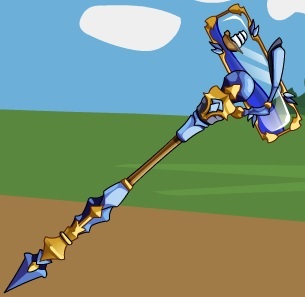 This ornate spear can call down a mighty storm of wind and ice! Currently discounted, for a limited time only! Shouldn't the bolded part be removed? 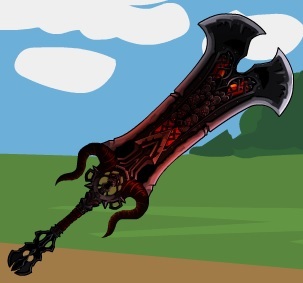 It's already been how long ago since the release of this weapon. Melee/Magic Earth Hammer, -5 BtH lean and 0.1 base lean, no special. Scales to player's level and gets the Guardian boost no matter what. MC is a simple +5% damage. Scales, so the #s below are just for example's sake. Note: This contest is still going on. All you have to do is log onto the server and kill at least 1 monster with your character, and it will continue until the end of this month (November 2017). Ranged Water Scythe, 1/3 BtH lean and -3 BtH lean. MC effect is +1/6 damage on the special. I'm not seeing either of the new items in the LTS. This blade shines bright, and cuts with a keen edge. It'll sap your health in exchange for a nice shiny damage boost, which is even greater if you're in a Bloodmage armour! This weapon can swap between Melee and Magic damage. Light Sword. Click to swap Melee/Magic. No Special, so +9% damage. All attacks do +25% damage (Melee) or +33.3% damage (Magic). You pay the listed HP cost per turn. Set bonus: If you're in Lumenomancer Bloodmage armour, then you do +10% damage. If you're in any other Bloodmage outfit, then you do +5% damage. 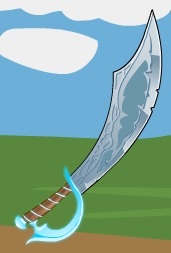 Energy Sword/Glaive, click to swap Melee/Ranged/Magic, no special, so +9% damage. For the first turn you have it and/or the shield equipped (both share the same counter) the weapon deals +5% damage. After that first turn, the weapon will instead deal +(5/0.15*0.5)% (AKA +16.66...%) damage if and only if the enemy never attempted to attack you the previous turn. This can be activated via Paralyse, Freeze, Daze, etc. All that matters is that the mob didn't attempt an attack on you the previous turn, and you get the boost. Magic Wind Wand, has a normal bow/wand special and a 20% special.